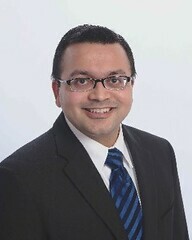 Post written by Madhav Desai, MD, MPH, and Prateek Sharma, MD, from the University of Kansas Medical Center. Barrett’s esophagus increases your risk for dysplastic changes that can turn into cancer. This subject has drawn our attention in last 2 decades with its rising prevalence, and now, we are in an era in which we can cure early dysplastic changes related to it. In this study, we examined the efficacy and safety profile of 2 different approaches for endoscopic treatment of Barrett’s esophagus (BE)-associated dysplasia and early esophageal cancer. Endoscopic mucosal resection (EMR) is used for diagnosis and staging of suspected areas. For high-risk lesions (ie, high-grade dysplasia or intra mucosal adenocarcinoma), further EMR sessions can be done to completely remove with follow-up to perform further focal EMR. Albeit efficacious, this approach carries a higher rate of adverse events, mainly strictures and dysphagia. Another approach, in which radiofrequency ablation (RFA) is used after initial EMR sessions, has been in use and is now a common practice. In this meta-analysis, we found that in patients with HGD/EAC, focal EMR followed by RFA seems to be equally effective as and safer than step-wise EMR. This study was important because: 1) composite analysis of either approach is not available in a large sample of BE patients; 2) no meta-analysis of either method or direct comparison has been available previously; 3) for clinical practice, these results will be immensely helpful in discussion of efficacy and adverse-event profiles of each method with the patients and allow for informed decision making as well as pre-treatment understanding of adverse-event profiles. This study will also provide a guide or framework for future endoscopic modalities for BE-associated dysplasia to compare efficacy and adverse event rates. Figure 2. 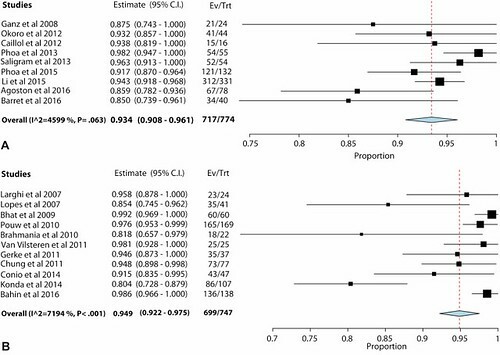 Forest plots of the proportion of patients achieving CE-N after f-EMR + RFA (A) compared with s-EMR (B) and CE-IM after f-EMR + RFA (C) compared with s-EMR (D). CE-N, complete eradication of neoplasia; f-EMR, focal endoscopic mucosal resection; RFA, radiofrequency ablation; s-EMR, stepwise endoscopic mucosal resection; CE-IM, complete eradication of intestinal metaplasia. We found that endoscopic eradication strategies for BE eradication, namely, f-EMR+RFA and step-wise EMR, are effective modalities with high eradication rates. f-EMR+RFA was able to cure BE-related neoplasia in 93 out of 100 patients and all BE tissue in 73 out of 100 patients, while recurrence of dysplasia was seen among 4% of patients during follow-up of nearly 2 years. Up to 80% of the patients were free of any visible BE tissue at last follow-up as per pooled estimate among f-EMR+RFA group. Our analysis supports the fact that f-EMR+RFA is safer compared to sEMR and equally effective. BE-eradication rates (CE-N rate and CE-IM) were higher with sEMR compared to f-EMR+RFA [95% vs 93% and 80% vs 73%, respectively]; however, this occurred at the expense of high stricture rate [34% vs 10%, respectively]. Indirect between-method comparison of outcomes showed that sEMR carries higher likelihood of developing strictures (4-fold increase) and overall adverse events compared to f-EMR+RFA with statistically significant findings. These findings confirm the intrinsic safety of f-EMR+ RFA in management of BE-related neoplasia with a favorable risk/benefit ratio.